Are you eating the right Cashew; Why are Cashew Nuts not Crunchy? It is said that the Portuguese brought cashew nuts to India. Who is even bothered now? It has been accepted and embraced because of the nutritiously rich nuts. 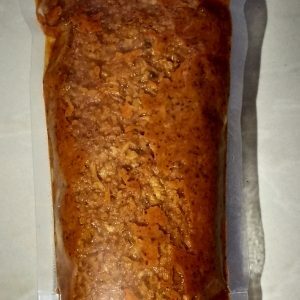 It’s not a satvic food, since it makes you lethargic and fat if you consume more. However moderation is the key to anything. Even medicine can turn poison if you over do it. 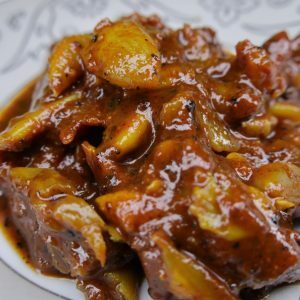 It is also believed that some modern day cashew nuts are artificially made from maida (all purpose flour) and other ingredients. Most Keralites Buy Cashew Nuts from Store! When we use to visit our village some 15 years back, cashew nuts were really tasty and crunchy. We never purchased cashew nuts from a store. There was abundance of it. However modern day store brought ones have neither that crunch nor taste. Also branded cashew nuts are highly priced; after a few days in the container it really becomes soft and loses its taste. 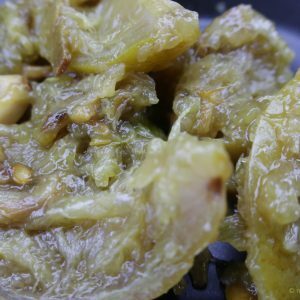 Why does not the Cashew Nut Crunch nowadays? 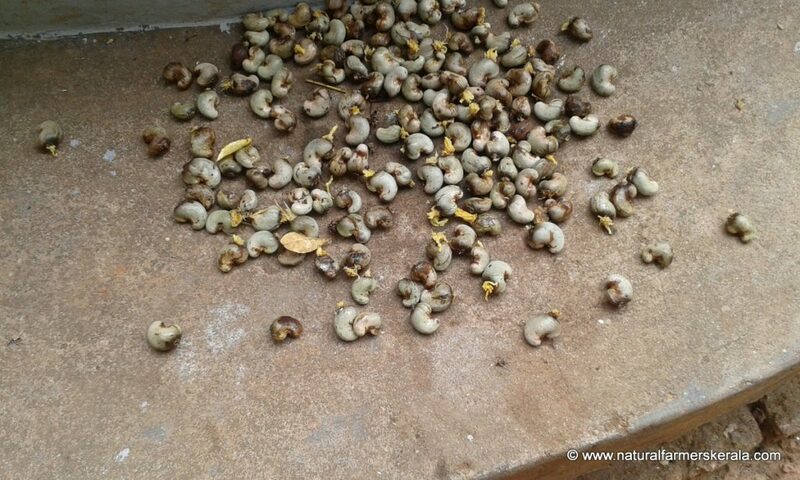 Cashew fruits are first harvested and then seeds separated from the fruit. Seeds are sun dried so the moisture level can be reduced to near negligible. Now they are ready for traditional roasting which is an experts job. 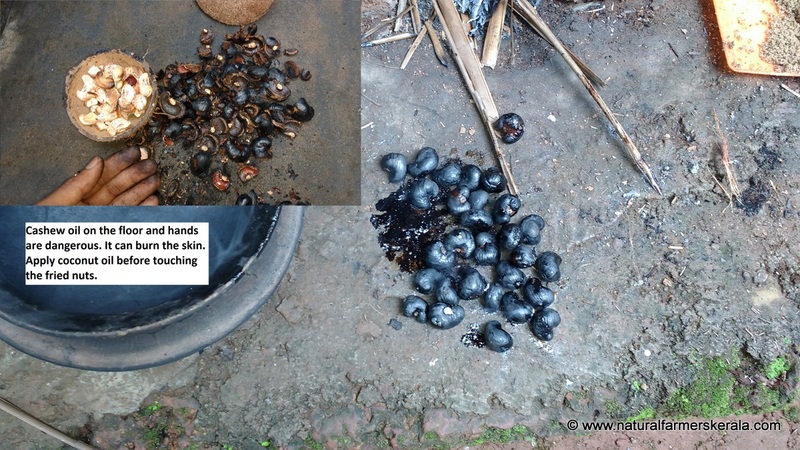 Traditionally some people would throw seeds in an open fire and take it out when all the oil inside the seeds has burned; leaving the nuts charred at most places. If you overdo it then you will have nothing but ashes. If under done, it will be difficult to extract and your skin will burn while just touching the oil. 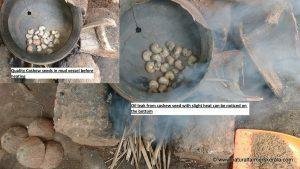 Correct and Traditional way of roasting cashew nuts in Kerala is as follows. Mud vessel with small crack at the bottom or side. No holes just a non visible crack will do. 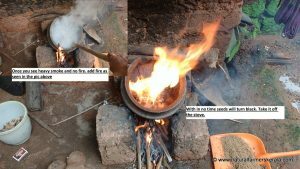 Dried Coconut leafs or Gas stove. Face mask and Hand gloves; fire proof. 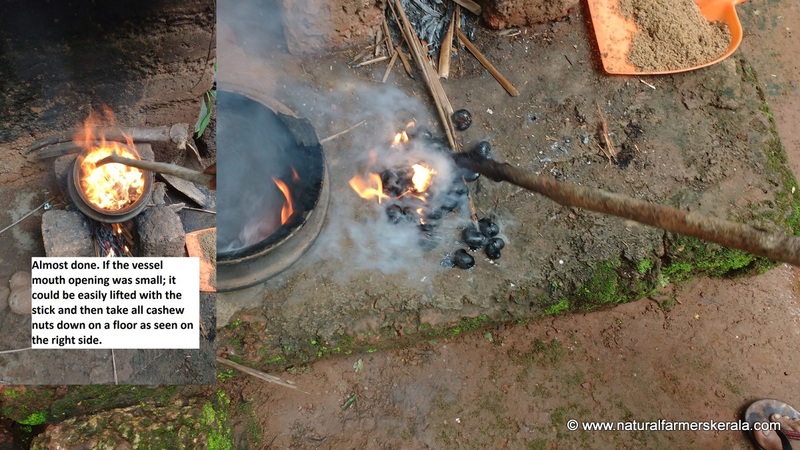 Keep the mud vessel on fire and add cashew seeds. Keep stirring the cashew seeds with the long spoon. Within few minutes oil will start oozing from the seeds. There will be lot of sound and gas. Don’t be afraid. 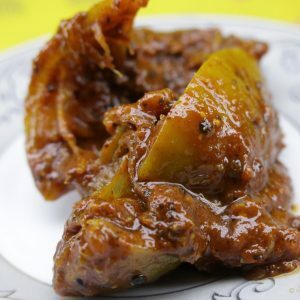 In case it doesn’t catch fire inside the vessel after few minutes, take a burning coconut leaf or newspaper pieces and throw it inside the vessel. It will catch fire. There will be explosion and fire spitting by the cashew nut seeds. Within less than 40 seconds all the cashew nuts will turn dark and will be done. Take it of the stove and dump all the cashew on the ground. Extinguish the fire with sand if it doesn’t stop naturally. 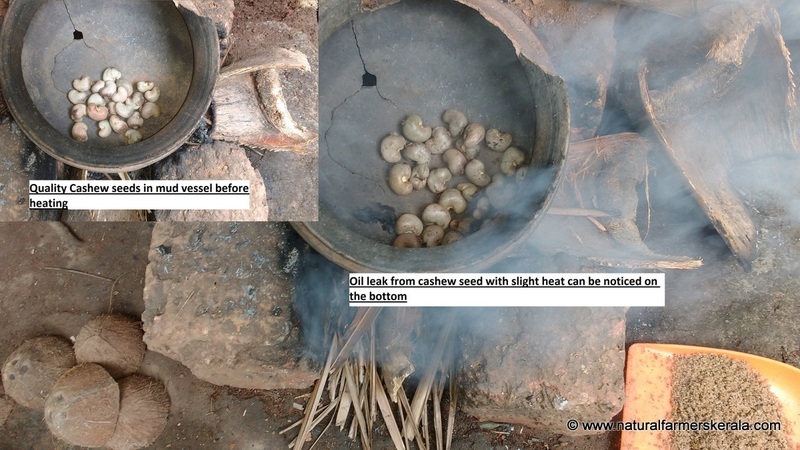 It takes practice to perfect the science behind roasting the ideal cashew nuts. Modern day store brought Cashew seeds are first steamed, cut and then nuts are hot air dried, there are many modern techniques. 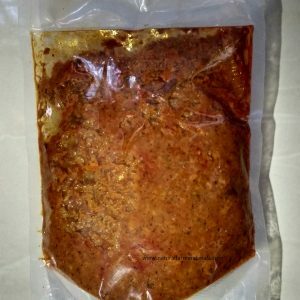 Some first extract the oil from seeds for sale. Oil also fetches good price. 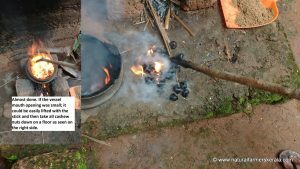 Main reason for taking the oil out is they don’t want cashew nuts to be charred, as oil catches fire extremely fast and combusts vigorously. Since factory made cashew seeds are not roasted with its oil, cashew nuts don’t turn crunchy and lack many other benefits. As per ayurvedic text, nuts are a great source of nutrition and protein, fat which performs some important function in our body, and myriad of other plant nutrients, antioxidants and trace minerals. All this is healthy for a body provided you have good digestion as nuts are heavy and it’s generally consumed during cooler months, as most seeds generate heat. So people with vata body type can eat during most times. Anything if you overdo will have side effects. People with allergic condition may have problems. Check out the above video to see cashew nuts spitting fire while roasting. Explained so well. Very nicely written. Will follow the guidelines.